. 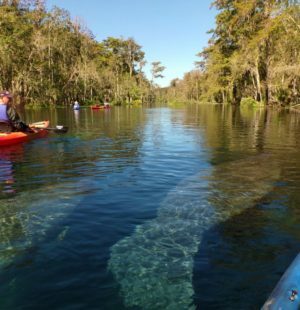 Kayak Florida offers Florida kayak tours, including manatee tours near orlando, and some of the most beautiful springs in Florida. Experience a Florida manatee tour in the Orlando area in beautiful Blue Springs. Blue Springs State Park is the winter home to over 400 manatees. Kayaking is truly the best way to interact with these mystical mermaids and not disturb them in their daily routine. This manatee tour is also an amazing Florida wildlife adventure, with abundant wildlife at every turn. We also offer a slow paced, informative kayak tour in Silver Springs, with wild monkeys, alligators , beautiful water birds, and manatees in their natural habitat. Interested in seeing Dolphins in the wild? Check out our Dancing dolphin Eco tour in St Augustine! Our Florida kayak tours are structured for easey paddling, scenic landscape, and viewing the Florida manatee. All of our University of Florida certified master naturalist guides truly love and care about what they do and it shows. Our exciting guides are CPR certified, and they take pictures of your adventure, so you can cherish your experience forever. The Florida manatees are gentle giants. Their elegant existence in the wild, is an amazing experience to watch. Viewing them from a kayak, is a simplistic and memorizing encounter. You can rest assured that your guide will conduct a safe, informative, friendly and fun wildlife adventure. Our kayaks are super comfortable with integrated seat backs, which offer great support for your lower back, and they are super stable as well as coast guard inspected annually. We also offer, carbon fiber paddles, which are super light and easy on your arms and shoulders. We take pride in our service and equipment, and our kayak tours are second to none. Join us and step out into the beautiful wild Florida today! WE ARE PROUD SUPPORTERS MAKING A POSITIVE DIFFERENCE! © 2017 Copyright Kayak Florida - All rights reserved.